It falls upon the unabashed Queen's supporter — Zwellin' it like it is — to reflect on Queen's 1-2 start. Contending every year? Being the team to beat? A Queen'sman craves not these things. This Queen's Golden Gaels season shaped up as being all about a young team that could be a tough out in an OUA quarter-final come Oct. 30. In terms of overall plot, it seemed like a way to set the mood for the third act of coach Pat Sheahan's tenure. (That 1-7 year in 2000 and '03 overtime semifinal loss to Laurier framed Act I rather admirably. The curtain fell on Act II last Nov. 28 in Quebec City as the coach himself has noted, although the point didn't sink in on headline writers who persist with "defending champs" headlines that are true in fact if not tangible reality. That is still in play roughly halfway through an OUA season that's had an oddball bent since Waterloo's admins — please thank them for Billy McPhee — reduced it to an odd number of teams in June. First off, Queen's could even drop both of its back-to-backs against Ottawa and Western and sneak into the playoffs. That might reduce the urgency to pick a quarterback after Justin Chapdelaine struggled Saturday in Guelph and was relieved by McPhee, who had better luck moving the offence. It's within the realm to think the Gaels, even if they don't bank a win over a quality opponent, could get into the 6 vs. 3 quarter-final with a 3-5 record. That would likely mean a late October trip to McMaster (2-2), which would be a neat parallel with 2006, when that second act of the Sheahan era started gaining steam. 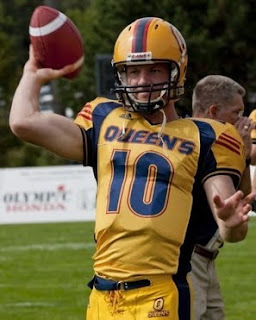 Secondly, that fits in — although there would be no prompt to get, guh, philosophical, if Queen's was 3-0 instead of 1-2 — with one of the beauties of Gaels football. It is not about staying near the top each and every year. It's more about having that one edition of the Tricolour, every generation or so, that gets to the summit. Some CIS schools have a good program for contending for a conference championship every season. Queen's has a good program for winning a Vanier Cup in each decade, give or take a few years. That's not meant as excessive arrogance. It is just borne out of necessity and part from need. The necessity, as many have noted, is the university's academic rigours dictate some ebb and flow with the Gaels' depth. They will always have a good core of high-end players. They don't have such a big tent, as it were, that they can well-stocked at all 28 positions despite graduations or key injuries. The need is pretty simple. It's nice to be in the spotlight since good football is part of the Queen's image, a point of reference in much of Canada. It's just not needed all the time. That would be vain, out of step with those lingering vestiges of English-Canadian understatement. If you really want to rationalize an off-year, remember that the OUA's route to the Vanier Cup includes a likely Uteck Bowl game at Laval, where the Rouge et Or are pretty damn tough in national semifinals. Getting to the top means tearing down, rebuilding, tinkering, tweaking. Football is, after all, a game of reinvention. Someone much smarter — Chuck Klosterman in Eating The Dinosaur — already wrote about this. It also speaks to a reality that rewarding experiences, the ones which are part of growing, have to be unpleasant, agonizing at the time. It was like that in 2005-06 when the likes of Brannagan, Mike Giffin, Thaine Carter, T.J. Leeper, Jimmy Allin, Osie Ukwuoma, Scott Valberg and other were in their first and second seasons. That '06 team had a four-game losing streak in the sandwich part of the season, Weeks 3 through 6. Its play reflected a team which knew it could be something, but didn't know what that something was, exactly. They had some hard-to-watch games, but it worked out pretty well eventually. Three games in, there are elements of that with these Gaels. Let's let's not lily-gild. It was ugly Saturday, starting with Chapdelaine missing a wide-open Devan Sheahan on a early series. Missing Derek Morris on the offensive line no doubt has played a role in Jimmy Therrien rushing for only 83 yards (only a measly 3.2 per carry) the past two weeks. And there were the four interceptions. Guelph tailback Nick FitzGibbon also went off for almost 200 yards; last season, Queen's held him to less than 30 rushing-wise. Still, there's a lot to like. Ted Festeryga, the hockey convert, by times has seemed like a human elastic band at rush end. Sam Sabourin, the linebacker, is in early contention for rookie-of-the-year honours in the OUA. Frank Pankewich gets in quarterbacks' faces. McPhee has earned the quarterback-of-the-future tag quicker than expected. Long-time observers such as CFRC 101.9 FM's Tim Cunningham mentioned a budding McPhee-Chapdelaine quarterback debate even before the Guelph game. The QB who eventually emerges will have a good supporting cast of blockers (think Josh Prinsen, the new right tackle) and receivers (think Giovanni Aprile). There just might not be enough to like for the casual fans who took the Gaels' appeal beyond its usual reach last November. However, in its way, the current state of affairs is more enriching for us football diehards. (Did you notice the fourth season of Friday Night Lights had the coach Kyle Chandler portrays switch from coaching the perennially contending Dillon Panthers to the starting-from-nothing Dillon Lions, with the same colours and nickname as York?) There is some appeal in going back to basics, seeing another group of Gaels take form. It's football for its own sake, and it might be more authentic than anything else. It is going to take time, and plenty of patience from the two Pats (Sheahan and Tracey), but there's confidence the Gaels can climb back up again. It might even be a preferred state of being for a true fan. It's better to be the hunter instead of the hunted, anyway.